Figure 1: Evolution of the magnetic state of a thin FeO layer during growth, investigated via nuclear resonant scattering. The disappearance of temporal beats after oxidation indicates that a predominantly nonmagnetic oxide is formed. Deposition of Fe leads to the formation of a chemically pure FeO layer. 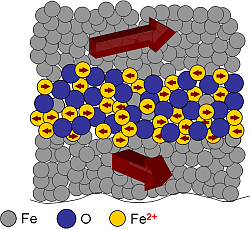 Further deposition leads to ferromagnetic ordering in the top Fe layer and hence, to the increase of the magnetic ordering temperature of the FeO, which becomes antiferromagnetic at room temperature. Figure 2: Temperature dependence of the magnetic hyperfine field distribution of a buried FeO layer, as extracted from evaluation of the nuclear time spectra. Below 90 K an additional component appears around a hyper fine field of 25 T that is attributed to interfacial spin freezing. Published as: “Stabilization of Antiferromagnetic Order in FeO Nanolayers”, Physical Review Letters 103, 097201 (2009). Ferromagnetic order in thin films is strongly affected when their thickness is reduced to the nanometre regime. The main reason for this are thermal excitations that lead to fluctuations of the magnetic moments. It is well known that thick antiferromagnetic buffer layers with a high magnetic anisotropy can be used to stabilize magnetic order in ultra-thin ferromagnetic films. This effect is of high importance for modern data storage technology. On the way to further miniaturization one consequently asks what happens to antiferromagnetic layers in the ultra thin limit and how their magnetic properties are influenced by surrounding magnetic material. These questions are subject of an investigation involving ultra-thin layers of Fe and its native oxide. Following the pioneering work of Beach et al. who revealed intriguing magnetic properties of ultrathin native iron oxide layers , we studied the growth of nanometer thin FeO layers via nuclear resonant scattering (NRS). Surprisingly, we found that once a FeO layer is sandwiched between ferromagnetic layers, a drastic increase of its Néel temperature (the temperature below which antiferromagnetic order appears) is observed. 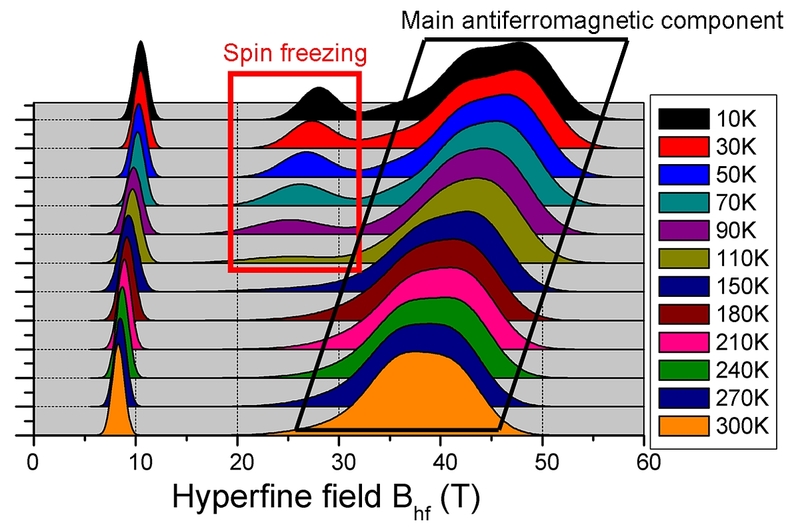 The high sensitivity of the experimental method to magnetization dynamics (close to the GHz regime) allowed to reveal that at very low temperatures interfacial spin freezing occurs that leads to exchange bias. The NRS experiment was performed in-situ at the ID18 beamline of ESRF. The isotope sensitivity of NRS, in combination with a probe layer approach, was used to select only the signal originating from the oxide layer (see Fig. 1). In this way one discriminates against the strong magnetic signal of the neighbouring Fe metal, which normally prevents the detection of the oxide’s magnetic state using conventional techniques. This approach was used to monitor the chemical and magnetic state of the oxide layer during its growth. The basic results are summarized in Fig. 1. We start with a 2 nm 56Fe layer on top of which a 0.6 nm 57Fe layer (the NRS active isotope) is deposited. This layer is subsequently oxidized by controlled admission of oxygen into the vacuum chamber. A sudden change from pure magnetic Fe to a chemically disordered, predominantly non-magnetic oxide is observed. Remarkably, the deposition of one atomic layer of Fe on top of this non-stoichiometric oxide leads to the formation of a chemically pure FeO layer , which appears to be non-magnetic. With further deposition of Fe, a sharp magnetic transition is observed in the oxide, which indicates that its Néel temperature TN has effectively climbed above room temperature. We expect that this magnetic transition coincides with the appearance of long range ferromagnetism in the top Fe layer, which is only possible once a critical thickness is reached. Ex-situ temperature dependent measurements allowed us to estimate the TN to be as high as 800 K, very close to the Curie temperature TC of the neighbouring Fe layer. This similarity is not a coincidence, as the proximity of very thin ferromagnetic layers often leads to a convergence of TN towards the TC of the ferromagnetic material. For antiferromagnetic FeO in contact with a ferromagnet one expects a horizontal shift of the hysteresis loop, the so-called exchange bias phenomenon. Here, however, this shift is observed only at temperatures below 30 K. The analysis of the NRS data revealed that at the same temperature where the exchange bias transition takes place an extra magnetic component in the hyperfine field distribution appears, shown in Fig. 2. This component could be attributed to spins which progressively freeze in with decreasing temperature and remain in a fixed orientation below 30 K. From that we can deduce that exchange bias in this system is linked with interfacial spin freezing. In conclusion, this study unravels in a remarkably clear fashion how the magnetic state of an ultra-thin antiferromagnetic layer can be stabilized by adjacent ferromagnets. As a result its effective Néel temperature raises by several hundreds of Kelvin. In the case of FeO, this leads to antiferromagnetic order at room temperature, an effect which mediates strong interlayer coupling in Fe/FeO multilayers . In contrast, the temperature below which exchange bias is observed decreases with decreasing thickness of the oxide layer, pointing to a stabilization mechanism that is related to interfacial spin freezing. G.S.D. Beach, F.T. Parker, D.J. Smith, P.A. Crozier, A.E. 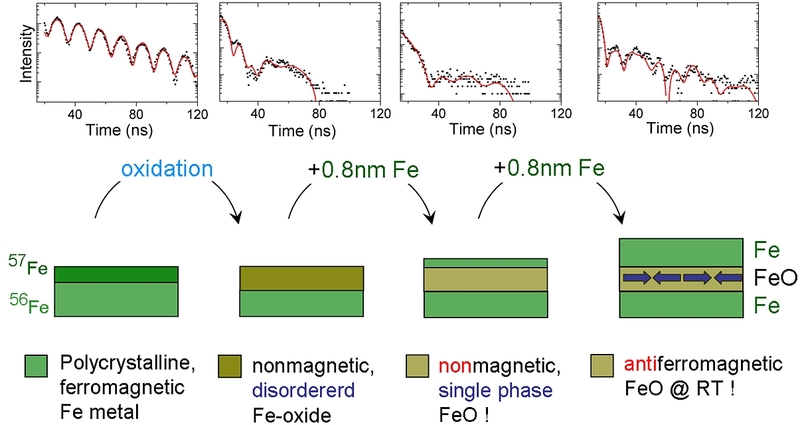 Berkowitz, "New Magnetic Order in Buried Native Iron Oxide Layers", Phys. Rev. Lett. 91, 267201 (2003). S. Couet, K. Schlage, Th. Diederich, R. Rüffer, K. Theis-Bröhl, B.P. Toperverg, K. Zhernenkov, H. Zabel, R. Röhlsberger, "The magnetic structure of coupled Fe/FeO multilayers revealed by nuclear resonant and neutron scattering methods", New J. Phys. 11, 013038 (2009).